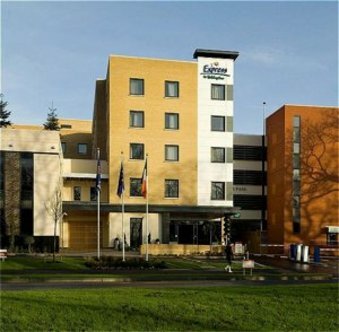 The Express by Holiday Inn Dublin Airport is adjacent to the Crowne Plaza hotel and its Conference Center, located 85 acre mature parkland setting. The Hotel is near Dublin Airport with transport links to Dublin City Centre, an ideal location for the business and leisure traveller The hotel is near the M1/M50 motorways, the and Dublin business districts including the IFSC, as well as the historic sites and attractions of Dublin City CentreA Courtesy Coach is available to/from Dublin Airport&regwith a journey time of just 5 mins - see timetable.In addition Express By Holiday Inn Dublin Airport features 21st century technology &reg Including High Speed Internet Access. The hotel is located within 10 minutes from a variety of Business Parks around Santry and Dublin Airport area.